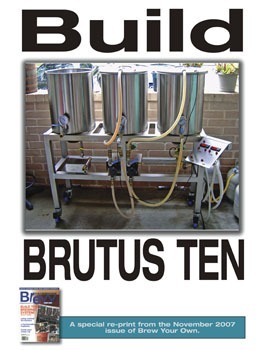 This is the digital version of our Build Brutus Ten All-Grain Brewing System Plans. You will receive a link to download a pdf version of these plans. To purchase the hard-copy version, click here. A special re-print from the sold out November 2007 issue of Brew Your Own. Build your own single-tier, all-stainless brewery! In this piece we lay out everything you need to construct your own Brutus Ten, a 10-gallon (38-L) semi-automated, completely awesome work of brewing art. Includes a detailed materials list with pricing, step-by-step diagrams, photos of the construction in progress and diagrams on how to use the system.